87. ^ His death brings to an end a remarkable intellectual career dedicated to the meticulous analysis and rigorous critical expansion of the Freudian discovery. Laplanche was born on 21 June 1924 to a family of wine producers who owned the prestigious Château de Pommard in Burgundy. In 1940, at the age of 16, he moved from Burgundy to Paris in order to study at the Lycée Henri IV with the aim of eventually reading philosophy at the École Normale Supérieure (ENS). It was at the Lycée that he first met his future collaborator JeanBertrand Pontalis. After completing his secondary education Laplanche spent 1943 and part of 1944 working with the French Resistance before enrolling at the ENS for the 1944–45 academic year. There, he was taught by some of the foremost philosophers of the day: Ferdinand Alquié, Gaston Bachelard, Jean Hyppolite and Maurice MerleauPonty. It was thanks in particular to Hyppolite and Alquié that Laplanche became interested in psychoanalysis. His interest intensified when in 1946–47 he won a scholarship to Harvard University. There, he studied at the progressive Department of Social Relations, coming into contact with professional psychoanalysts as well as cultural anthropologists working with psychoanalytic ideas. Having returned to Paris, at Alquié’s auspicious recommendation Laplanche entered into an analysis with Jacques Lacan that would continue until 1963. By 1951, after taking the agrégation de philosophie, he had decided to become an analyst himself. To this end, following Lacan’s advice, Laplanche undertook medical training. He took on psychiatric internships and wrote a qualifying thesis on schizophrenia and the poetics of madness in Hölderlin (Hölderlin au détour de sa folie et de son œuvre), obtaining his MD in 1959. His analysis with Lacan was retrospectively treated as a training analysis, and his own analytic supervisions took place in 1959–60. In 1961 Hölderlin et la question du père, the monograph based on Laplanche’s medical thesis, was taken up by Daniel Lagache for the series ‘Bibliothèque de psychanalyse’ published by Presses Universitaires de France. This inaugurated a relationship with PUF that would continue for the rest of Laplanche’s life. By 1962 Laplanche had secured his first teaching position at the Sorbonne. In the following year, Laplanche – along with other important figures of his generation such as Pontalis, Didier Anzieu and Daniel Widlöcher – broke institutionally with Lacan in one of several organizational upheavals that fractured the French psychoanalytic community during this period. 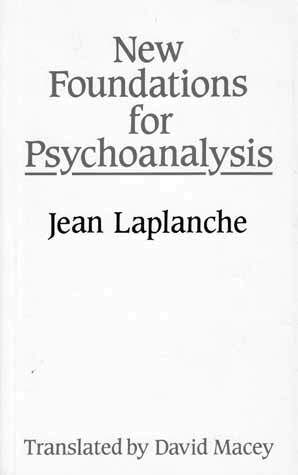 Laplanche belonged to Société Française de Psychanalyse (SFP), an organization that Lacan had established a decade earlier without recognition from the International Psychoanalytic Association (IPA). In 1963, amidst controversy over Lacan’s teaching and analytic practice, the IPA agreed formally to recognize the SFP on condition that Lacan be removed as a training analyst. The organization became terminally split between those faithful to Lacan and a majority open to the embrace of the IPA. Laplanche was in the latter faction. In spite of his immense admiration for his mentor, he had already set out certain metapsychological differences with him in a 1960 paper co-authored with Serge Leclaire (‘The Unconscious: A Psychoanalytic Study’), and he was – and would remain all his life – deeply opposed to Lacan’s practice of short sessions. The SFP was dissolved; the Lacanians went on to found the École Freudienne de Paris, while rest formed the Association Psychanalytique de France (APF), with the official imprimatur of the IPA. Laplanche would take up the presidency of the new organization from 1969 to 1971. Laplanche and Pontalis gave a dynamic and diachronic exposition of individual concepts, tracing the trajectory of their development and remarking the implicit theoretical shifts and slippages in their progressive elaboration. The book remains unsurpassed in its depth and rigour and has been translated into more than twenty languages. Laplanche brought to bear the principles of psychoanalytic interpretation on the Freudian corpus itself. His goal was not to produce a psychobiography of Freud, but dismantle the ‘manifest’ history of Freudian thought in order to track what he called ‘the latent and partially unconscious history’ running counter to it. This latent history was the site of Freud’s lost and marginalized concepts, of the determined intellectual repressions and exclusions, the recursive circumventions and implicit theoretical imbalances which subtend the stated logic of the work. Laplanche’s critical purpose was double: first, to grasp in all its complexity and contradictoriness the internal logic according to which Freud’s thinking actually unfolds; and second, to show by means of a rigorous dialectical reading that this logic is linked in an essential way to the fundamental object of Freud’s reflection. The latent tensions, re pressions and countercurrents legible in the evolution of Freud’s thinking were, he showed, symptomatic discursive correlates of the real contradictions and exclusions inherent in the psychical world Freud describes. Vie et mort was the first sustained demonstration of how, under Laplanche’s gaze, Freud’s thought appears not just infinitely richer than certain psychoanalytic orthodoxies would have us believe; but as having a history whose very fault-lines and incoherencies can be seen to replicate something essential about the psychical life of the human being. In the same year as he published Vie et mort, Laplanche became Professor of Psychoanalysis at the University of Paris VII. There, in the wake of May ’68, Laplanche had co-founded the new Centre for Teaching and Research in the Clinical Human Sciences. He would always remain convinced that psychoanalysis had a rightful and independent place within universities, not just in training institutes populated by clinicians, and that the intellectual freedom and rigour provided by the university framework was critical for the sustained vitality of the discipline. During his time at Paris VII he thus instituted a controversial doctoral programme for non-clinical researchers in psychoanalysis. He also became the director of a new book series for PUF, ‘Voix nouvelles en psychanalyse’, which would publish monographs by some of the best graduates of the Paris programme, and established a quarterly journal, Psychanalyse à l’Université (1975–94), bringing together new work by university researchers and APF clinicians, as well as previously unpublished material by Freud and Melanie Klein. The teaching seminars that Laplanche gave as part of the doctoral programme at Paris from the early 1970s to the early 1990s were published in a series of seven volumes titled Problèmatiques. Taking up and critically adapting from Bachelard and Georges Canguilhem the substantive notion of a ‘problematic’, these volumes resumed and amplified the distinctive methodology demonstrated in Life and Death, interpreting Freud’s work vis-à-vis the structured and structuring conceptual fields that underlie the history of its theoretical development. Progressively emerging from this painstaking retraversal of Freudian problematics was Laplanche’s own reformulation of psychoanalytic metapsychology. In 1987 he published Nouveaux fondements pour la psychanalyse. This book offered both a synthesis of the five Problèmatiques that had already appeared and set out in the most extensive and systematic way yet the coordinates for a rethinking of metapsychology derived from them. At the core of this rethinking was Laplanche’s radical re-elaboration of Freud’s early, and abandoned, ‘theory of seduction’. With the seduction hypothesis Freud had initially argued that neurosis was a consequence of early sexual trauma. Laplanche’s approach to seduction was entirely distinct from naive and dangerous efforts to re habilitate Freud’s old hypothesis in the form of so-called ‘recovered memory’ therapy. Laplanche proposed the removal of seduction from the purely pathological sphere so as to give it a grounding position at the origin of normative psychic development. Reworking Freud’s rudimentary hypothesis into a ‘general theory of seduction’, Laplanche stressed the foundational role of the adult other, and the other’s unconscious, in the very formation of the subject’s psychical apparatus, the psyche’s essential components – ego, unconscious and superego – being viewed as secondary to the primal, ‘enigmatic’ inscriptions of the other, and as deriving their specificity from the partial successes and necessary failures of the infant’s attempts to master, symbolize and ‘translate’ those inscriptions. The general theory of seduction was the major gravitational core in all of Laplanche’s substantial metapsychological writings after 1987. These writings are largely represented by three remarkable collections of essays that progressively deepened and diversified the perspectives set out in New Foundations: first, La révolution copernicienne inachevée (1992; this work also collected several papers from the 1960s and 1970s), Entre séduction et inspiration: l’homme (1999) and finally Sexual: la sexualité élargie au sens freudien: 2000–2006 (2007, translated by Jonathan House and Nicholas Ray as Freud and the Sexual: Essays 2000–2006, International Psychoanalytic Books, 2012). The anglophone world has often been slow to appreciate that Laplanche is something more than a brilliant reader of Freud, but this more overtly ‘independent’ theoretical work has generated great interest in Continental Europe as well as Latin America and Canada From 1988 until his death Laplanche was also the scientific director of a French translation team working on the Œuvres complètes de Freud for Presses Universitaires de France. The distribution among disparate French publishers of the legal rights to Freud’s texts meant that no single unified French translation of Freud had previously been available. The Œuvres complètes project was undertaken independently of any institutional control. It was also committed to a translation of the Freudian text that was as free as possible from the interpretative tidyings-up and synthetic cogencies that have accrued to work from generations of theoretical dogma. Deploying a meticulously wrought and consistent conceptual vocabulary, the project was dedicated above all to accuracy, even and especially when the original might have appeared most in need of ‘embellishment’ or ‘repair’. ‘“Doing justice” to a great text’, Laplanche wrote in a late retrospective essay, ‘means not masking but restoring its contradictions, its weaknesses, its moments of hesitation and imprecision, even its incoherencies.’  For much of his life, Laplanche divided his time between Paris and Burgundy. Alongside his intellectual commitments, he and his wife Nadine were the proprietors of the Château de Pommard from 1966. In 2003 they sold the Pommard estate, although they continued to live there when not in Paris and to take an active part in the production of the wine. Laplanche continued writing well into his eighties, producing innovative theoretical papers on the psychic topography, gender and polymorphous sexuality, as well as authoring timely polemical interventions in the debates around the ‘validity’ of psychoanalysis that became so vociferous in France in the 2000s. These late papers were the texts gathered in Sexual: la sexualité élargie au sens freudien: 2000–2006, which would be his final book. Nadine, Laplanche’s wife of sixty years, died in April 2010. After her death, Laplanche mainly restricted his work to the Œuvres complètes project and to the facilitation of the translation of his own writings into other European languages. He died in hospital at Beaune, as a result of pulmonary fibrosis. Along with both the brilliance of particular readings and translations of Freud and the rich potentiality of his own metapsychological developments, one of the most remarkable things about Laplanche’s work as a whole is its systematic cogency and consistency. From the outset, the very movement and structure of his thinking were an enactment of his conception of what analysis is, or can be. In a text from the early 1990s, ‘Le temps et l’autre’, he returned to the etymology of ‘psychoanalysis’, stressing the vector of decomposition and desedimentation implied in the Greek root analuein, ‘to undo’ or ‘unweave’. Psychoanalysis, he argued, is a work of meticulously ‘unbinding’ the ties that sustain conscious discourse, not with the aim of psychic entropy but so as to facilitate less repressive, more enabling constructions, syntheses and links, which must supervene: ‘psychoanalysis [is an] unweaving [undertaken] so that a new fabric can be woven, [a] disentangling to al ow the formation of new knots’. Laplanche’s enterprise in its totality was, in this specific sense, a lifelong analysis of Freud’s work – a ceaseless traversal, examination and disentangling of the manifest fabric of his thought in order to allow for new and rigorous means to conceptualize and evolve what Laplanche called the ‘Copernican’ exigency that guided Freud’s original breakthrough. In ‘Le temps et l’autre’ Laplanche took as his model for the labour of analytical disentangling the figure of Homer’s Penelope at her loom. In his view, reading somewhat against the grain, Penelope was an exemplary figure of mourning; her work of repetitive weaving and unweaving was an emblem of the gradual yet inexhaustible unpicking of the ties binding her to a husband who may never return, and the partial orientation of that work towards the possibility of a new composition. In this account, mourning emerges as the very prototype of analytical endeavour. Both are a reckoning with the past, a working though of the legacy of the other, which is structurally interminable yet partially oriented towards a future. The death of Laplanche brings to a close an immense labour of reckoning by one of Freud’s most assiduous and devoted legatees. He leaves us with a remarkable body of thought, and a lasting call to analyse, to mourn. 1. ^ Jean Laplanche, Life and Death in Psychoanalysis, trans. Jeffrey Mehlman, Johns Hopkins University Press, Baltimore, 1977, p. 1. 2. ^ ‘In Debate with Freud’, in Jean Laplanche, Freud and the Sexual: Essays 2000–2006, trans. Jonathan House and Nicholas Ray, ed. John Fletcher, International Psychoanalytic Books, New York, 2012, pp. 275–6. Routledge, London and New York, 1999, p. 254.